A new lawsuit that was filed today on behalf of the families of half of the 36 people who were killed in a warehouse fire in Oakland in December adds the utility PG&E to a lengthy list of defendants that also includes the building's owner and master tenant. Speaking at a news conference after the suit was filed in Alameda County Superior Court, Mary Alexander, the lead attorney for the plaintiffs, said, "We're here to bring justice to the families of those who died and to hold accountable those who caused this horrific fire" at the Ghost Ship warehouse on Dec. 2. Alexander said the new suit expands upon lawsuits that were filed on behalf of two victims' families in December that mainly focused on allegations of negligence against Chor Ng, the owner of the warehouse at 1315 31st Ave. in Oakland's Fruitvale neighborhood, Derick Ion Almena, the warehouse master tenant, and his wife, Micah Allison. She said the new complaint also names PG&E as a defendant because she and other plaintiffs' attorneys believe that the utility "was negligent in supplying power to the building and failed to make it safe." 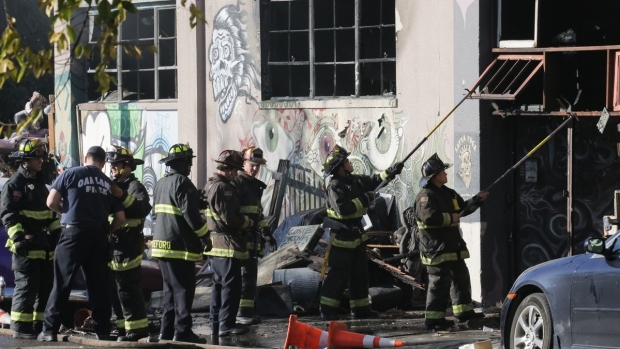 An attorney representing the families of several victims killed in December's Oakland warehouse fire is expected to file new allegations against the building's owner and landlord Tuesday morning. Bob Redell reports. Alexander said, "PG&E failed to follow its own rules for providing electricity in a safe manner and acted with conscious and willful disregard for peoples' safety." The suit says, "The interior of the 10,000-square-foot Ghost Ship was a death trap that contained a maze of makeshift rooms, alcoves and partitions." It also alleges that the warehouse "lacked a safe means of access between the upper floor where the music was and the exit on the ground floor" and "lacked adequate and sufficient fire safety measures and was not up to fire protections and life safety codes." The suit says the electrical system "was overloaded with excessive" use by the dozens of people who lived and worked at the Ghost Ship. It alleges, "There were often sparks from the electrical system that smelled and circuit breakers blew out often. 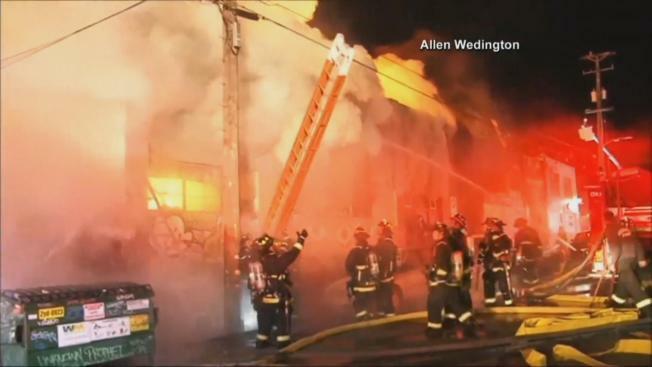 Overloaded electrical lines at the rear of the Ghost Ship likely contributed to the fire." In a prepared statement, PG&E said, "We've reviewed our records and over the last 10-plus years we have no reports of electric theft or any other anomalies from this location or the adjacent premises." The utility said, "We're fully cooperating with authorities as they investigate this tragic event." Among the other defendants named in the suit are that night's performer, Joel Shanahan, whose stage name is Golden Donna, Jon Hrabko and a business called "100% Silk," claiming they, along with Almena and Allison, were organizers of the Dec. 2 event, which was attended by at least 100 people. Christopher Dolan, another attorney for the plaintiffs, said that although the city of Oakland isn't named in the suit that was filed today, he believes it is "absolutely culpable for what happened because it turned a blind eye to the death trap" that he believes the Ghost Ship warehouse was. The Alameda County District Attorney's Office is conducting a criminal investigation into the fire but spokeswoman Teresa Drenick said the probe is ongoing and she doesn't know when it will be complete. Almena's lawyers have said he didn't engage in any criminal misconduct and alleged that government agencies are responsible for the fire. Ng's lawyer didn't respond to a request for a comment on the suit. Leisa Askew, the mother of fire victim Cash Askew, 22, who grew up in San Francisco and lived in Oakland, said she's participating in the lawsuit because "36 people died and that is so wrong and I can't just stand by." Holding a photo of her daughter, Askew said Cash "was a beautiful person and a talented artist and musician who was going places." Cash Askew attended the University of California at Santa Cruz and was a member of Them Are Us Too, a Bay Area musical duo that makes textural music.